Rating: 84 percent based on 817 votes. 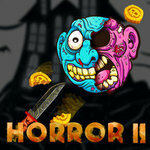 Description: Knife Hit Horror 2 is a Halloween themed version of the popular knife throwing game. Pick up your knives, take aim, and throw them at the target as you try and hit the monster head.